Present imperfect may be incorrect as a tense but it is flawless as a sentiment when speaking of food that has been conceived to tempt by the senses of smell and taste, rather than to lure admirers by artful cosmetics . Contrived artifice tastes best when displayed behind glass but is found wanting when compared with the sensuality of the warm scent emanating from the butter and lard pastry case, containing thick spears of melting green asparagus set in Parmesan flavoured custard, as it is taken from a hot oven. Falling for the made up tart behind the plate glass, understandable as it may be, is to court disappointment and disillusionment. However artisan in spirit and skill may be the creator, the numbing truth is that it was not made with you in mind. It was not made with anyone in mind: it was made with money in mind. I feel the same about fine dining which I place on the same soulless plane as very expensive whores. There is, and has always been, a market for both but the majority of that market is as undiscerning as it is well heeled. Discernment is not in the remit of such suppliers, only the artifice to create the illusion of discernment in the minds of the wallets that they are emptying . For me, only the warmest bespoke tart will do, even if the extremities have been knocked about a bit. 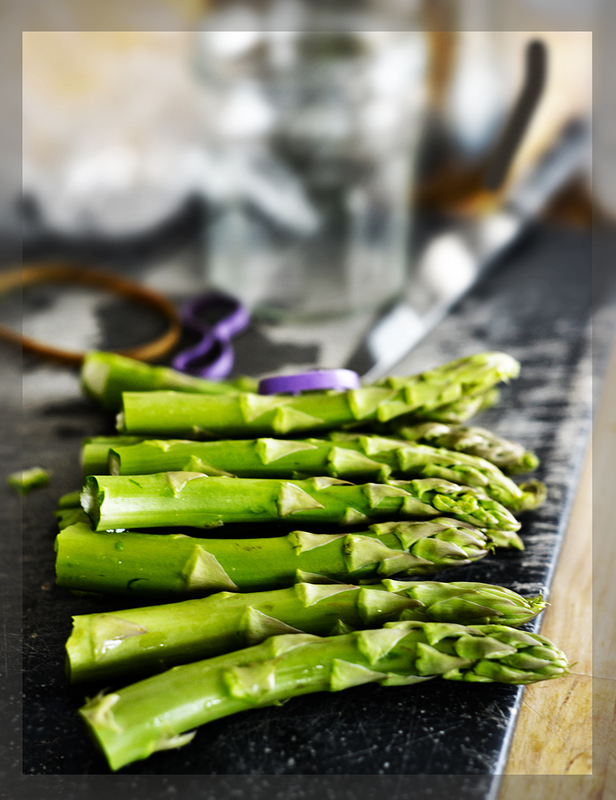 This entry was posted in 2014, asparagus, baking, Cheese, Cooking, Cuisine bourgeoise, Digital photography, food, Food and Photography, Food photographer, Parmesan, Photography, photography course, tart, Uncategorized, Vegetables, Writing and tagged baking, clear thinking, cooking, delicious confection, digital photography, food, Food photographer, food photographers, France, Humour, Photography, Photography course, writing. Bookmark the permalink. 65 Responses to Present Imperfect.. I imagine it tastes as good as it looks. The custard part looks pale and creamy. The pastry light and crisp and then………..little green circles to make it picture perfect. “It was not made with anyone in mind: it was made with money in mind.” That is a great concept, and sums up so much, food and so much else. Sometimes I imagine you writing your posts on an old typewriter. There might be a tumbler of scotch and a cigarette involved. My favourite bit – “…as undiscerning as it is well heeled.” Adore your writing, love the photo. And that pastry looks fabulous…not a soggy bottom in sight! not much to say but: Hmmmmm!! a very delighted, hungry, want-to-have-some one!! I think all the best tarts have had their extremeties knocked about a bit Roger – that’s what makes them so good! Some powerful truth there! Thanks Roger. Scrumptious post! There is indeed something sensuous about asparagus. Much prefer the green ones though; the white ones (which the French prefer) leave me cold. I know just what you mean. I have to say that I eat much less asparagus in France than I used to in England. I don’t know why this part of the Vendee has such a scarcity the green variety. Beautiful picture of the asparagus. Reading your wonderfully evocative description of your culinary delight, even with ‘knocked about extremities’ had me lusting for this tart….. I often have to remind myself food pictures aren’t always what they seem, and it’s supposed to look better than the actual product. My homemade food has terrible presentation, but I’m sure it is much more edible than the ones in a magazine. I’ve had my first fresh asparagus from the farmer now – it’s a bit early this year due to the warm winter and early spring. I will have to be thinking about making a tart like yours – it’s making my mouth water even though I’ve just had supper! Nothing imperfect about that tart. I am so looking forward to local asparagus. It was the pastry that really made it…so short. Fools and their money are soon parted applies to far too many Sydney food offering establishments (and also supermarkets offering produce perfect in appearance but lacking in taste). We persist as there is some attraction in dining sans preparation and washing up but when we consider what the cost of a meal out would buy us in terms of fresh market food, it’s not very often we feel we’ve come out the better. We will anticipate we will one day be money poor and time rich, an exchange which will at least benefit our eating. That’s the time space that we have reached, and I think we’re better for it. Back to asparagus we go 🙂 ! Well, a few foodie stuffs from my infrequent trips to Fauchon’s have actually lived up to their looks and some from the Harrod’s Food Hall [just kiddin’] titillated one’s taste buds, but basically have to agree with you again 😀 !! I don’t quite agree with you about ALL ‘fine dining’ establishments: places like the ‘Taillevent’ in Paris and ‘Moulin de Mougins’ near Cannes have actually delivered 🙂 ! I am going back a number of years, but actually loved both – the quiet elegance of the first and the beautiful garden setting of the second and the offerings were not streaks of sauce and dots of vegetables one could not taste 😀 !! For me the yearly visits were wonderfully relaxing and, at my age then, I guess one did not think about the behind-the-scenes 🙂 ! Just hedonism – no apologies, Milord!!!!!! There’s no question that people love them. I spent a lot of time in them both in my role as photographer and for pleasure. In the end their self importance overshadowed any of their qualities. Blame this reprise on a very happy lunch of baked marinated lamb shanks all nicely gooey and a good glass of coloured waters! I suppose I would annoy the hell out of you also if I admitted to going to ‘Lasserre’ for fun, good food and quiet ‘people watching’, loving the ‘Gavroche’ in London’ and not minding one little bit sitting on the 6th floor of Hotel Hassler [home away from home in Rome for decades] both for the view and some very fine Roman dining!! One almost did not need the marvellous food: the view sufficed!!!! Sorry, Roger . . . . Soft laughter . . . . Thank you…glad you felt that. Do that, Tandy, you’ll like it. You’re right, Roger. Food made with one’s loved ones in mind is always the best. Congratulations on being a finalist in the Pink Lady Food competition: richly deserved. Your photography is always tummy-rumblingly good. Personality over beauty. Works with food, too! That looks so delicious! I can almost taste it through the screen! Brava! If that tart tastes as good as it looks, it must be divine. 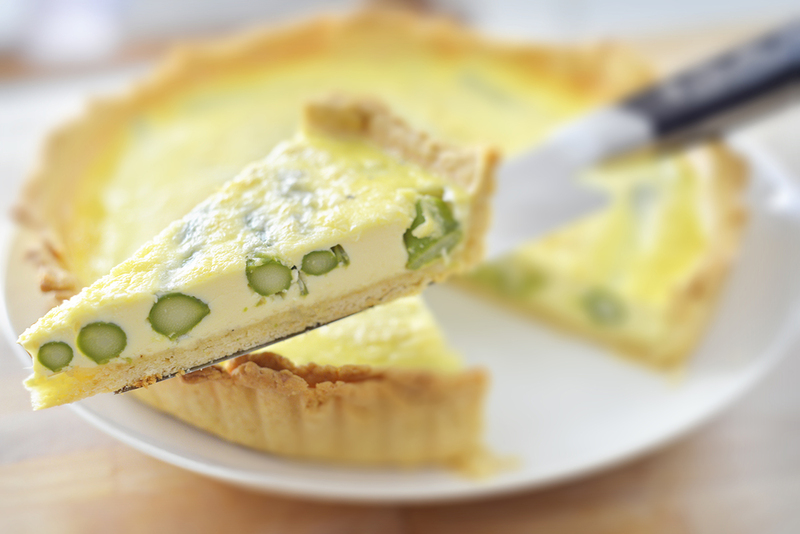 What an incredible looking slice…the tart crust looks flaky, the custard light and creamy and the asparagus still so green.